It's not enough to know how to use SolidWorks, if your job also requires you to install or maintain it, train new users, and implement standards. This in-depth guide was written for those of you who have to actually manage your company's SolidWorks system. From hardware selection to helping users to licensing and more, this is the everyday, bread-and-butter SolidWorks administration resource that IT and CAD managers have been seeking. Get the high-level assistance you need to efficiently manage SolidWorks in your enterprise or small business. Matt Lombard is an independent mechanical design consultant. Because of the popularity of his SolidWorks blog Dezignstuff, and sessions at SolidWorks World, he has built a reputation as the go-to resource for everything SolidWorks. Part I: Preparing for SolidWorks. Chapter 1: Defining CAD Administration. Chapter 2: Preparing Information Technology. Chapter 3: Preparing Document Management. Chapter 4: Operating System Tools You Need to Know. Chapter 6: Installing the Software. Chapter 9: Maximizing Your Use of Templates. 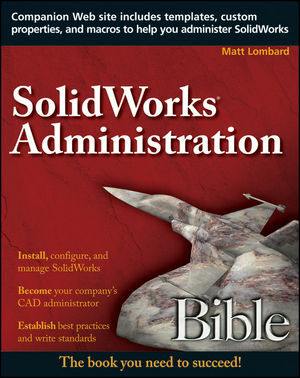 Chapter 12: Writing a SolidWorks Standard. Chapter 13: Using Custom Properties. Chapter 14: Establishing Best Practice Rules. Chapter 15: Automating Tasks with the API. Chapter 16: Supporting SolidWorks Users. Chapter 19: Rolling out New Service Packs. Chapter 20: Rolling out New Versions. Part IV: SolidWorks Workgroup PDM. Chapter 21: Introducing SolidWorks Workgroup PDM. Chapter 22: Installing and Configuring the Vault. Chapter 23: Establishing Permissions and Managing Toolbox. Chapter 24: Establishing Client Best Practice. Appendix A: Online Help Resources. Appendix B: Sources for Standards. Appendix C: Tools, Options Menu Settings.